Maddie age 3 and her half sister Cosette who just turned 1. They are the best of friends. Love each other so much. When we found out Maddie's mother had her last litter she would ever have and they had one little girl left we couldn't resist. Two Coton's ARE even better than one! It is so true that 2 Coton's are better than one! Thank you for a great picture, they are amazing & look so happy. They say that Cotons are related to the water dogs, but like you said not always crazy about water. I have 2 Cotons as well & only one of them is crazy about water. Sherry, they actually don't really like swimming too much. I have heard most Coton's do but Maddie isn't crazy about it and Cosette doesn't seem to be either. They both have life jackets though and wear them with no problem. They are wonderful travelers. Maddie has been to Canada twice and we took them both to California last year and Cosette was only 4 mo. old! She did great! They love to go! Lots of pet friendly hotels now that are great, and we camp alot too. They r very cute. Congrats on ur adorable family. You two girls are just precious, how special that you were able to get half sisters. We have really kicked ourselves for two years in not getting Cottons half sister when we had the chance.......yes, it is nice in having two for them. For us seems to be difficult taking two when we travel and go certain places. They are both just beautiful! 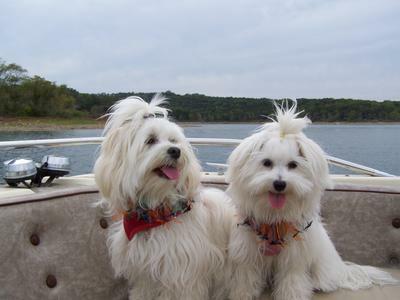 Looks like they are enjoying their boat ride. Do they enjoy swimming?